A hefty rib with chili-infused ratatouille demands a wine with power and substance. Then we are looking for an odd, personal terroir in a hot amphitheater in the heart of Alsace. Sporen is a sun-drenched terroir with a marly soil poor in limestone which gives tremendous volume and moderate acidity, a distinctive vineyard that yields a wine with pronounced schizophrenic character - is it Riesling, Pinot Gris and Gewurztraminer? 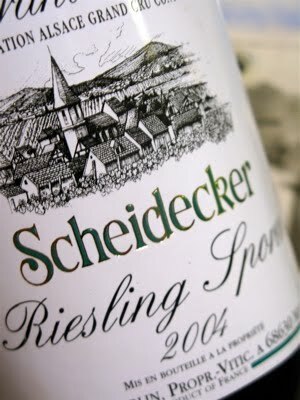 2004 Riesling Grand Cru Sporen, has developed a deep, exotic scent with dried apricots and roses. The taste is contradictory with minerality, great body and integrated sugar. A splendid wine revisited. Price: € 8.